Guest Post – Jemimah Knight: "Bass Soul". “Hi, I read Steve’s blog and listen to Lobelia‘s beautiful voice when I can. It’s a privilege I take for granted really, but maybe we do so when we know good people who can make music. I grew up with a musical family around me, my father is like some musical polymath – he can play most things – although the violin is a bit tiny for him maybe. My mother has a beautiful voice, she sang a lot more when I was small and she was professional. My brother, plays bass, I play bass badly and my dad – as mentioned, annoyingly also plays bass well. So, I’m the black sheep of the family with my regular job for a big company when those around me taught me well the value of beautiful sound and the ability to create it. I love to sing harmonies – but that’s often along to the radio. In reading Steve’s blog here, I am reminded that learning an instrument is something really very important, it’s like speaking a different language physically, translating sound into time and emotion in ways that writing and speech cannot. Sadly my strengths lie in the latter categories and I imagine some would question even that. I still have an ear for bass tones and my mild synaesthesia draws me to it over and over from viola, through cello, to bass. Yeah – I was orchestrally trained so much less rock and roll than Steve. Anyway, my point is that learning about music, to make music and what it means to hold that particular skill, is irreplaceable. Even in comparison with music appreciation, everyone loves a great song or a brilliant band, but nothing compares to creating sound and colour for every mood. The first ever book I learned from as a whippersnapper was called “Bass is Best” – and I still believe it. Without the bass section, who cushions your rhythm to swing your hips? Who soars from the deepest reaches of your heart way up into the human vocal range of joy? Who’s there to add that richness to any song, any piece or even alone? 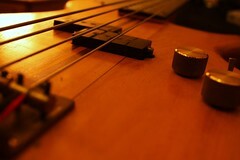 If I could advise people who want to learn, I’d say Bass of course. It might seem lonely without a band to begin with, but there’s always the radio and look here at Mr SolobassSteve himself, you don’t need the whole get up to get down. Also, if there is a sound you can make a mistake with, a bass guitar or better a double bass is forgiving. She will allow you to be incorrect and not berate you with the squawk of a woodwind or brass instrument or harder still the shrill exclamation of a violin! Great article! A revelation that you play Bass – we lurk everywhere 🙂 Couldn’t agree more.